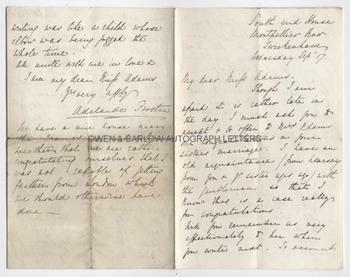 ADELAIDE PROCTER autograph Letter Signed. British (English) poet, author, feminist and philanthropist. ALS. 4pp. South End House, Montpellier Row, Twickenham. Wednesday, September 17th [no year]. To Miss Adams. "Though I am afraid it is rather late in the day I must ask you to accept and to offer to Mrs Adams our congratulations on your sister's marriage. I have an old acquaintance (from hearsay from you and your sister ages ago) with the gentleman so that I know this is a case really for congratulations. Will you remember me very affectionately to her when you write next. To account for my delay in writing to you I must tell you how I have been occupied for the last five weeks, very unpleasantly as you will acknowledge. I was staying for a few days near Epsom and began to feel so ill that I determined in spite of the remonstrances of my hosts to come home and most fortunate it was that I did, for I took to my bed in a nervous fever. I am still though what is called 'convalescent' very weak and shattered and had no more strength than served to be brought here - where the good air is doing me good and returning slowly my strength. I have never been well since an eight weeks attack of influenza I had before Easter and they say (the Drs.) that perhaps this last illness may eventually do me good. 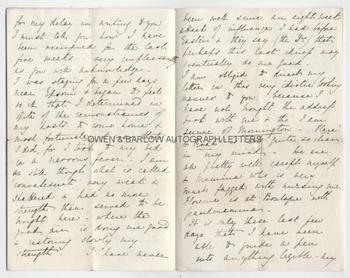 I am obliged to direct my letters in this very idiotic looking manner to you, because I have not brought the address book with me and tho' I am secure of Mornington - Place? or Road? is not quite so clearly in my mind. We are all pretty well, except myself and Mamma who is very much fagged with nursing me. Florence is at Boulogne with Grandmamma. It is only these last few days that I have been able to guide a pen into anything legible - my writing was like a child whose elbow was being jogged the whole time. All unite with me in love and I am my dear Miss Adams, Yours very affectionately" [etc]. "We have a nice house near the Thames and such delicious weather that we are rather congratulating ourselves that I was not capable of getting further from London which we should otherwise have done." 8vo. Approx 7 x 4.5 inches. Some old dust soiling to fold lines of last leaf. All else fine. Adelaide Procter was, for a time, one of the foremost poets of her generation. Her books sold in huge quantities, second only to Tennyson. Many of her poems were set to music - perhaps the best known being 'The Lost Chord' that was set to music by Sir Arthur Sullivan. Adelaide Procter was a close friend of Charles Dickens and she collaborated with Dickens, WILKIE COLLINS and Elizabeth Gaskell on the short stories 'A House To Let' and 'The Haunted House'. Her father was the author and poet Bryan Waller Procter, who was a close friend of Thackeray (Vanity Fair is dedicated to him). Adelaide Procter worked on behalf of unemployed women and the homeless and it is her unrelenting effort in this direction that was blamed by Dickens for her early death from TB at the age of only 38. She never married and there has been much speculation that she was a lesbian. Although the fame of Adelaide Procter as a poet diminished after her death, recent reappraisal of her work has established her importance in 19th century literature and as an early and influential feminist. 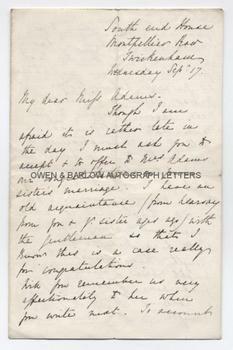 Good autograph letters of Adelaide Procter are uncommon.